Your little one is not so little anymore… in fact he or she is all grown up and graduating from high school or perhaps college. My baby (son) returned to college to further his degree however, graduation day extends beyond the traditional four-year schedule. A full time job and a full class schedule are not always manageable. We did send out graduation announcements when Red attained his associate degree but chose to hold off on the party. Anyhow, whether the children are finishing high school or college, you can announce their graduation (and party too if you want) in style with Tiny Prints’ Graduation Announcements and Graduation Invitations. One week only, Tiny Prints is having a huge 25% site wide sale. Customers get 25% off all orders through April 16. PROMO CODE APRIL25. 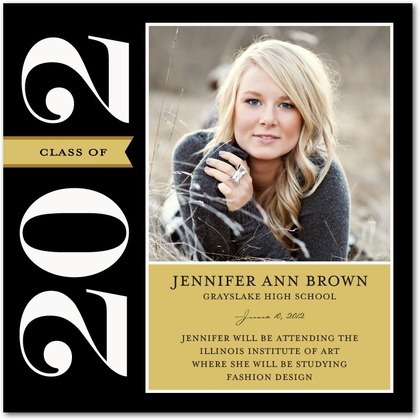 Customers can get 15% off Grad announcements, invitations, thank you cards…Plus Free standard shipping for orders $49.99 and up. The promo CODE: 15GradFS Good through 4/24/12. Why should you choose Tiny Prints for your graduation cards? First, every card is reviewed by their professional team of designers and etiquette experts. Secondly, you can customize your cards front to back with photos and text…for FREE! Third, Tiny Prints has a huge selection to choose from, over 1,000 graduation designs in all! New for this year, they even have designs including their Greek Collection for sororities. The announcements and invitations are second-to-none. Statements such as classy, stylish, and eye-catching to say the least appropriately describe Tiny Prints selections. Finally, for those who have been too darn busy to order graduation announcements, Tiny Prints can even get them to you in 2 days. They offer a Super Rush Delivery for not much more money. Those promo codes will to help offset the additional delivery costs too, just sayin. So share the excitement with custom college graduation announcements from Tiny Prints! Find the perfect design from their stylish selection of cards that feature the class year, school colors, with your own text and pictures. Be prepared though—once everyone receives these cards the demand to display that new diploma is sure to skyrocket! Be sure to visit by April 17th to receive that 25% discount! Visit momforum to see what other moms are saying about kids and graduation. Thank you for sharing this. My friends was looking for something like this for her kids. Discounts are always what we all want to save money and take advantage of it.. Thanks for your help here.. I am sure mommies would take advantage of this for their kids..